The Napoles Bathrobe radiates pure penthouse elegance. Designed for the lady and gentleman, this all white double faced Terry robe with its two deep pockets and smoking collar, exudes cultured sophistication. 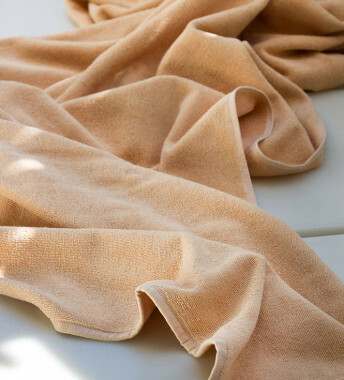 The inside fabric is 80% cotton and 20% polyester for softness. The exterior is 100% polyester, providing a classy, distinguished look. 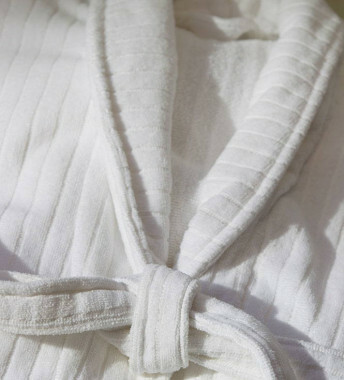 The sleek style of the Napoles Bathrobe is completed with a matching white belt. Treat yourself to a touch of opulence! In application of the French law of 6 January 1978 relative to information technology, computer files and freedom, you have the right to access, to modify and to delete your personal information. All requests and claims should be addressed to: Meliá STORE/HOTELSATHOME - 163 rue de la Belle Etoile - Business Park Paris Nord 2 – Bât 6B - 95700 ROISSY EN FRANCE - France. By registering your email address, you agree to receive the marketing news of Meliá Store by email. You can unsubscribe at any time via the links in each of our emails. Meliá Store – May the journey continue at home. © 2019 Meliá Group and Hotels At Home, S.A.S. The names, brands and logos shown on this site are trademarks registered by Meliá Hotels & Resorts. All rights reserved.